One day at his cousin’s house talking about futbol, Junior’s cousin said “I’m doing another sport, you’d never guess.” His cousin had just started as a surf instructor at our surf school. Junior had never heard of anything like Surf before and asked all about it. His cousin showed him pictures of boards, waves, and people standing on boards riding waves. From that day on he was crazy to learn to surf. 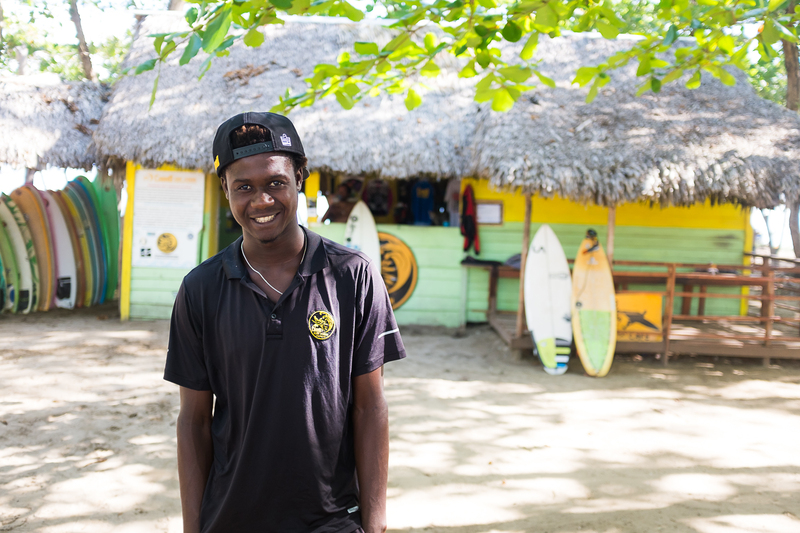 One day he made it to our surf school here in Cabarete and it was so fun and as Junior says “I was so happy.” He’s been surfing daily for three years and plays futbol in the afternoon after his work shift. Junior has been with us for two years now and speaks fluent English, Spanish, and Creole. Our guests love his chill vibes and positive attitude.